Runners starting their ultra marathon at the Town Hall in George Town, eager to tackle the tough race ahead. HUNDREDS of participants were flagged off at the Town Hall in George Town, Penang, determined to tackle the inaugural 100km Penang Ultra Marathon. 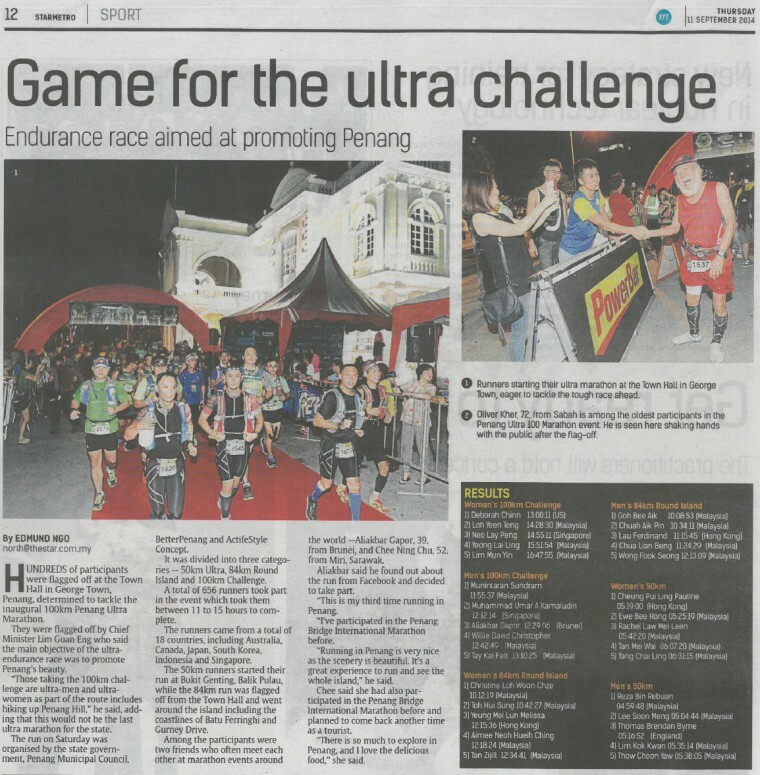 They were flagged off by Chief Minister Lim Guan Eng who said the main objective of the ultra-endurance race was to promote Penang’s beauty. “Those taking the 100km challenge are ultra-men and ultra-women as part of the route includes hiking up Penang Hill,” he said, adding that this would not be the last ultra marathon for the state. The run on Saturday was organised by the state government, Penang Municipal Council, BetterPenang and ActifeStyle Concept. It was divided into three categories — 50km Ultra, 84km Round Island and 100km Challenge. A total of 656 runners took part in the event which took them between 11 to 15 hours to complete. The runners came from a total of 18 countries, including Australia, Canada, Japan, South Korea, Indonesia and Singapore. The 50km runners started their run at Bukit Genting, Balik Pulau, while the 84km run was flagged off from the Town Hall and went around the island including the coastlines of Batu Ferringhi and Gurney Drive. Among the participants were two friends who often meet each other at marathon events around the world —Aliakbar Gapor, 39, from Brunei, and Chee Ning Chu, 52, from Miri, Sarawak. Aliakbar said he found out about the run from Facebook and decided to take part. “This is my third time running in Penang. “I’ve participated in the Penang Bridge International Marathon before. “Running in Penang is very nice as the scenery is beautiful. It’s a great experience to run and see the whole island,” he said. Chee said she had also participated in the Penang Bridge International Marathon before and planned to come back another time as a tourist. “There is so much to explore in Penang, and I love the delicious food,” she said.